We are looking for unique high school seniors with great style. You'll get a free session, an be featured on our Facebook Page, websier, mall isplay, blog and in our advertising campaign. It's a great way to earn discounts on your senior portraits and help us showcase the latest styles and backgrounds for our studio. You do not need to be the perfect size or look like a model to be chosen. My decision will be based on personality, activities, and your eagerness to be in the program. 1. One hour session taken before March 31, 2010. 3-4 of your favorite outfits. 2. Your are required to purchase on of our senior portraits sessions at 50% off. 3. You will receive peronalized gift cards displaying your images to hand out to your friends. 4. You will receive 5 free facebook images and a slideshow of your modeling session to share. 5. For every gift card redeemed from your friends, you will received $50 off your final order and your friends will receive $50 twoard their senior portrait session fee. 6. A chance to win a spot in a national model fashion show for senior portraits. You must be a full time class of 2011 student. 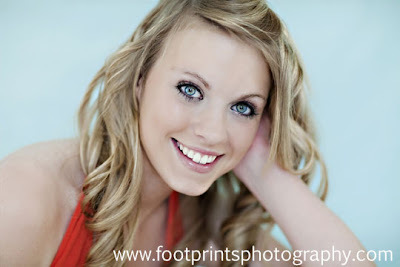 Have your senior portraits done exclusively at Footprints photography. Be involved in your school and community. You will need your parents permission. Payment for your summer senior session is required when you schedule your model session. Do you have a Facebook page? I tried to find you through search but nothing came up. HI Stacy, I am up under Erin Drallos.